Terry Mainwaring has lived in the Audley village all of his life (53 years) and is the son of the late Philip and Ada Mainwaring. Terry is a disabled person and his hobbies are model making and collecting models (sci fi mostly). His hobby helps with the boredom of not being able to get out and about. 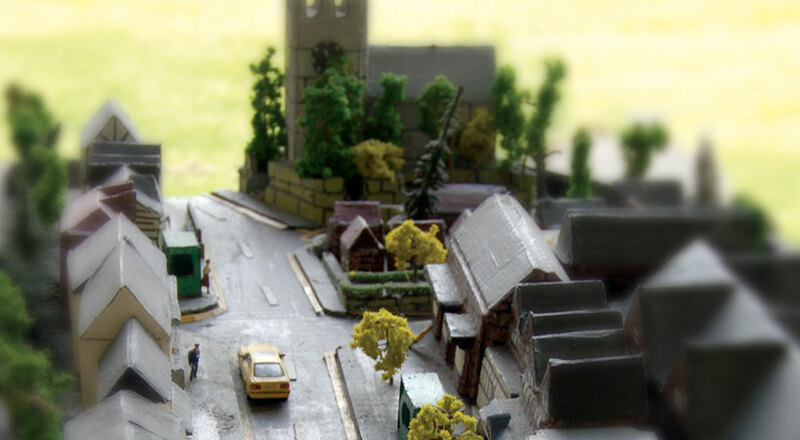 The Audley model which can be seen with this article and on the front cover of the magazine has been constructed from discarded pieces of cardboard,filler, paint and many cups of coffee and late nights. Terry has constructed over 100 models including cities like Manhattan, Jerusalem and even Llandudno Bay (which is his 2nd favourite place on earth). Sadly Terry lost most of his models in a house fire back in 2011, which was a devastating blow to him! Terry has now returned to his flat, after the fire damage had been repaired, but the model making is shelved for now. Maybe one day he will be on the hunt for more cardboard and another challenge. Terry contacted the magazine with the offer to any local group who have the space to display the model but Terry reports that it has now found a new home. Terry is very modest man who needs to be congratulated on his skills as a model maker. Keep up the good work.